This is the first book to offer a comprehensive explanation of how humans experience music and to unravel the mystery of our perennial love affair with it. Using musical examples from Bach to the Beatles, Levitin reveals the role of music in human evolution, shows how our musical preferences begin to form even before we are born and explains why music can offer such an emotional experience.Music is an obsession at the heart of human nature, even more fundamental to our species than language. 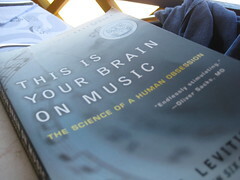 In “This Is Your Brain On Music” Levitin offers nothing less than a new way to understand it, and its role in human life. When I bought this book what I really wanted was Oliver Sacks’ Musicophilia but it wasn’t avaliable. I spotted this one and thought it might have some similarities and anyway regardless of whether it was similar or not it sounded interesting. I read a little of the introduction really to check it was worth buying and wanted to keep reading so decided to buy it. Unfortunately I didn’t think the rest of the book really matched up to the introduction. The topic was interesting enough to stop me from giving up, however, and the brief narrative sections were well enough written to bare the less well written scientific sections. Maybe because I have studied psychology I found that Levitin was rather repetative- I suppose for someone who only had a basic knowledge of psychology (the group that the book was aimed at) may find this made things easier to follow however I am unsure how well the bits were written, only when I was fully familiar with ideas (as with nature verses nurture tests in twins, for example) did I find them easy to grasp. While I understood the other ideas I did find them hard to read- and when a topic is complicated you really don’t want to have to struggle with writing style too. In other parts I got the impression he was trying to impress us with the psychologists, musicians and scientists he had met in his career and with all the studies he had done. While talking about experience within the field gives a certain authority I found this a bit much. When it came down to it the only chapter I really enjoyed was the last one which talked about the evolutionary advantages of music. I think maybe because neurology is difficult to understand it’s also difficult to explain, and I think Levitin may have been in above his depth whereas this was easier to explain. While Levitin may be able to explain things to his students for those with no experience in psychology I don’t think I would really recommend this book. The topic was promising but I don’t really think Levitin was the right person to write about it, at least not alone. Oh and another thing I found this book a bit too American, it would refer to traditional songs in America that I didn’t really know. Also it referred to lots of ‘older’ pop music which I’m not familiar with or only vaguely familiar with.